On Sale Now! Save 2% on the Physical Therapy AIDS 556752 Freedom Comfort Thumb Wrap by AliMed at Get Cheap Health Insurance. MPN: 556752. Hurry! Limited time offer. Offer valid only while supplies last. FREEDOM comfort (formerly Qualcraft) Thumb Wrap comfortably holds user's thumb in opposition while allowing unimpeded function of fingers and hand. FREEDOM comfort (formerly Qualcraft) Thumb Wrap comfortably holds user's thumb in opposition while allowing unimpeded function of fingers and hand. This thumb wrap provides excellent compression and support with its premium elastic two-way stretch material. Extra-long, removable metal stay extends from IP joint to wrist. 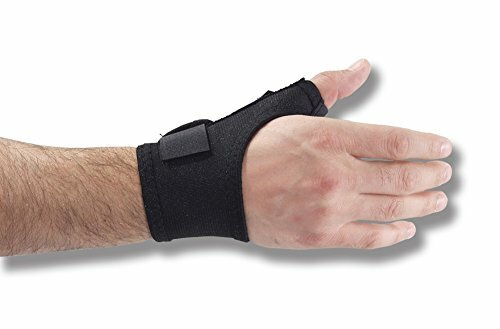 Easily adjusts for custom thumb positioning as well as mild support at the wrist. Wrap-on application and hook-and-loop closures at the wrist and thumb make this support easy to apply and remove.